No, not the Kenneth Branaugh version from 1993, although we will talk about that in a bit, but the 2012 Jos Whedon version. And yes, you did read that right. Now, how did this happen? How did I end up watching this film? NO idea. It showed up at my door from Netflix and I seriously have no recollection that it even existed. 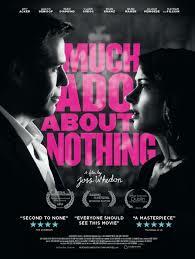 But who is going to argue with Jos Whedon and Shakespeare? Alright, what geek like me is going to argue with Jos Whedon and Shakespeare? But then I took it out of the package, and it immediately begged the question, what business did Whedon have making a modern version of Much Ado About Nothing? Kevin immediately asked, “Does it take place in outer space?” No. So we popped it in and the answer is in the Special Features. Whedon has had this informal gathering of creative people and Shakespeare reading at his Spanish-style villa in CA for the past so many years. One thing led to another (which might tend to happen when you know like five-hundred famous actors and have loads of money) and they shot the movie at Whedon’s in twelve days. I think it’s back-story makes it more interesting than it is on its own. Not that I would write this movie off, anyhow, but it does have some serious draw-backs. One, the main actor (sorry). I don’t think Benedick was cast right, at all, and neither did Kevin (while Beatrice was much, much stronger). Also, I think black and white is the only way to go with a half-informal, twelve-day remake, but it is distracting to the modern viewer. Also, it retains all the original language, which is handled well, but is beyond the patience of the average viewer (which could be said of any film like this). Also, it seems (subconsciously or coincidentally?) to borrow extensively from the acting in the 1993 version, so if you are familiar with it, that can also be distracting. Also, the simplicity of it is so extensive that Shakespeare’s plot holes shine. And–although I hate to admit it–there have always been plot holes in this particular play. I mean, why would Hero marry the fickle and impetuous Claudio after no less than two bouts of distrust, a public flogging, and the transfer of his marriage vows to her cousin? What sort of evil character is Don John, ruining his brother’s friend’s wedding? How dastardly! (sic.) And how is no one mad when a priest and a rich man fake someone’s death (through the funeral) to make a point? So what did I like? Beatrice’s and Hero’s performances, for a start. The nuanced portrayals of Borachio and Conrade. Whedon’s tactic to add silent things when he needed to, where the dialogue would not allow: like the transfer of Conrade into a girlfriend (from a sort of body guard) and the addition of the photographer (a speech-less part). And some of the more breath-taking cinematography, like the acrobats at the masquerade and the convening of the bad guys in the pool. I also thought Nathan Fillion handled his part as Dogberry very well… similar to Michael Keaton but without the element of disgust. I really believe the barely-contained hilarity of the Kenneth Branaugh version helps guide the viewer through the process of this Shakespeare comedy a little better, but the IMDB ratings agree with me barely. The Whedon version has received critical praise, almost as much as the Branaugh version. My only beef with the older version is Keanu Reeves. Sorry, Keanu, but you are always Keanu, so very specific roles fit you and Don John is not one of them, although I can tell you are trying. I will go snuggle with my copy of The Matrix now. 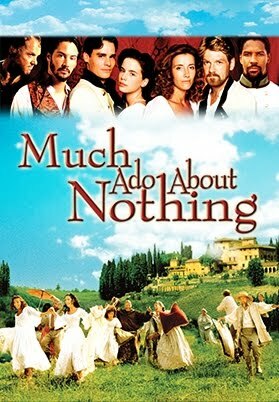 I have long been a fan of the crazy movie that is the 1993 Much Ado, so I am not impartial (nor am I impartial because I love Branaugh and Emma Thompson, which I have mentioned several times on this blog. Then again, I also really like Firefly). Perhaps I could suggest that you double dip these two movies, and enjoy contrasting them while also taking each as it is. Of course, I suggest you read the play first, because–like a true literary buff–higher than my love for any modern actor or director stands my awe for the works of Shakespeare. The only other adaptation of this play I might want to get my hands on is the 1984 BBC version for its Shakespeare series.